Look closely: do you notice anything different about my tire? A ladybug is hitching a ride! 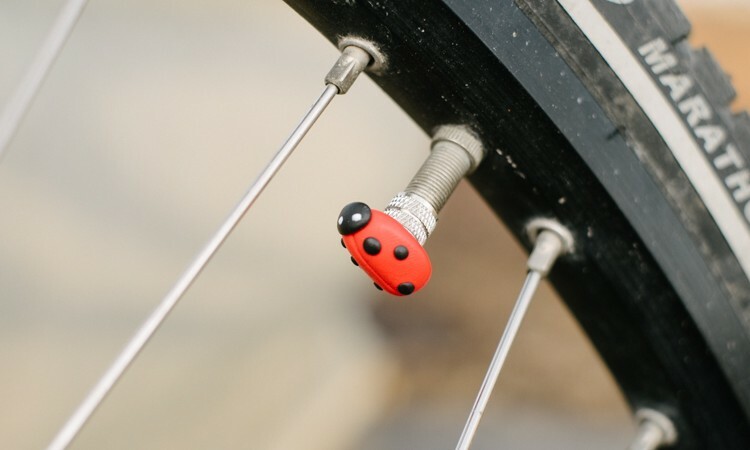 These ladybugs (and other designs) are called “jewelry for your bicycle” – love it! I guess these would be Oma’s earnings. More beautiful jewelry: this rosy bell would be perfect for spring. 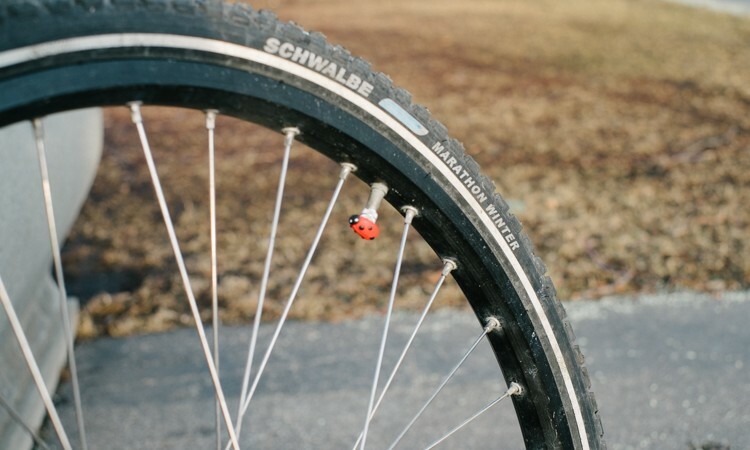 If anyone has always wanted a full ladybug kit for her bike, look no further. Here are Maria of PoCampo, Gosia and me after a lovely brunch. I’m so glad I had the chance to meet Gosia, hear a lot about bicycling in Krakow (sounds a lot like cycling in Chicago, actually), and learn more about her shop. She also has a Bike Belle blog, with plenty of beautiful pictures, so you can enjoy it even if you don’t speak Polish. Yay for cool, entrepreneurial cycling ladies! When I saw bike garters from Bird Industries available in one of those email flash sales a few months back, I decided to give one a whirl. This particular bike garter had been recommended a few times in our comments section, and I have a few skirts I like to wear on my bike that give me occasional modesty issues. The bike garter is pretty simple: It’s a garter with a clip much like an actual garter, but the clip is meant to grab your skirt, not a stocking. The Bird Industries garter I chose was a bright pink and size large since I wanted to make sure it was not too snug. The inside of the garter has a silicone grip, and it stays put on my leg without pinching (though it’s not the sort of thing you really forget you are wearing). The clip is not difficult to use, but the way it works was not intuitive to me: instead of pinching the end of the clasp to make the end that opens open, you push it up to open the clasp. The first time I wore the garter, I fixed the clasp to the hem of my skirt, on the side. It made a bit of a bubble hem, but looked pretty normal. You can also attach the clasp to a spot on the underside of the skirt. Both clasp methods worked to keep the skirt from flying all the way up, and did not impede my pedaling ability. However, neither kept the garter from showing. This is clear on the Bird Industries store, so it isn’t like they’re misleading anyone, but I was surprised by the way exposed garter made me feel. It still seemed that something was showing that ought not to be—and that “something” was bright pink! I didn’t take pictures of this situation for that reason. But it was easily resolved by tucking a small portion of my skirt hem under the edge of the garter at the side. I am not sure I would feel comfortable wearing this garter with a shorter skirt, like the ladies in the Bird Industries photos. Which is odd, because I don’t consider myself that shy about that sort of thing—it took me four years to buy one of these, after all. Garter clip in action, with garter safely covered. As I mentioned, I bought my garter clip on super clearance through one of those “final sale” flash shops, but the normal retail price is $12. Overall, it is an effective method of keeping your underwear under wraps, as long as you don’t mind flashing a garter instead. Do you use a bike garter?